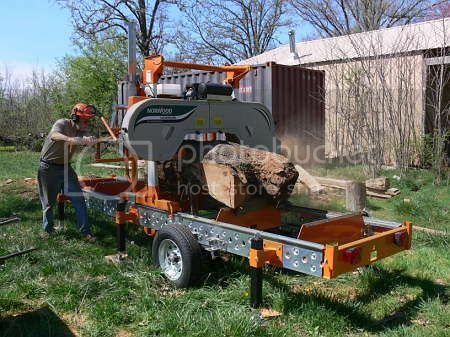 I noticed DM's posts from a couple of years ago and a lot of interest in his sawmill. Are you still running the mill? I've also read some posts from PlowPoint... who else is running a sawmill, or is interested in setting one up? I've run a Norwood (MX34) portable sawmill, and do a lot of milling for my own projects, as well as selling to area woodworkers. Almost all the wood I mill comes from salvaged logs that have died, been left in the woods to rot, or been bulldozed down, but some are provided by customers, too. The best part is that I get to pick and choose what I keep and what I sell. Last edited by Post_Oakie; 12-19-2013 at 03:11 PM. Thats a nice log P.O. nice cut through the fork where you get that grain figure. is that Wild Cherry? You never know what it looks like until you cut into it do you. 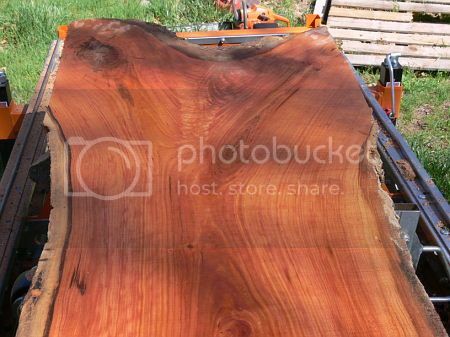 I've still been pulling out dead elm and making 6 x 6 beams for our homestead place when I get around to it, and looking at a Hemlock log to see if I can get it. it's been down about 3 years, and all off the ground except the end. it's pointed down a steep hill though and the root wad will come tumbling down into the creek when I pull on it,then I have to get it all out of our 6 in deep creek, I'd like to see some Hemlock boards somewhere to see if it's worth the work. its about a 20 in diameter log and I'd get 4 - 8 ft logs to mill. I have owned and run a Lucas swing blade mill for many years. I love that thing. I can haul it in a S10 pickup and have it set up in about a half hour. Made a lot of money many years ago cutting cants with it from "mined" cedar along the coast out here in Washington state. I cut three thousand feet of lumber for my current home with it and it just keeps on going. The only problems I have ever had revolve around the carburetor on the Briggs V-twin. Touchy damned thing and I just have to mess with it every once in a while. Other than that the saw is a pleasure to use. A few have troubles because they do not wedge the log tightly enough before trying to saw it. It is not rocket science...I have a 12 volt chain grinder that I touch up the blade with when needed and it has been a great little tool. Seems like I cannot get any pictures to resize small enough to be less than 50 kb , so decided to create a file on the drive share site. I'll keep posting as I take pics, since I seem to take one of almost every board I cut. well, not every board but it seems like it. still proud I can even manage to create a board I guess. another item I made and have a picture of is my home built log arch. I had an old trailer in my yard for years and the wood rotted away, but still had a good T frame made of thick pipe/ steel tubing. The tires even still had air. so I cut it up and welded back together a log arch. I've learned so much in the last six months I could have used for 20 years cutting firewood. The log arch works fine though I know it has limits on how big a log I can move with it. Need to refine the tie downs with better cables but it will come along. moved a 20 inch by 9 ft elm log today as a first test. Also cut into a nice 10 in sugar Maple log that has some nice spalting. too bad its a small log. seems like a lot of the dead wood I cut has some spalting in it, which I think looks pretty cool in the grain. Good day on the little mill today. Askew, sometimes I think about a swing blade mill, especially one with a slabber when I come across logs bigger than 32", but for now will stay with the Norwood band saw mill. If I have to quarter a big log with the chain saw, it just makes it that much easier to quarter saw the log. I cut a lot of oddball pieces, and the Norwood mill is well suited to that. Looking forward to seeing your photos. SevenCreeks, I have to use XAT Optimizer to reduce the size of the photo and compresses it. I reduce the image to 640 pixels wide, then compress to less than 50k. Unfortunately, it isn't free. There are other programs out there, too. Here's a walnut crotch that I opened up on the sawmill. Turned out pretty nice. Nothin' to it! All a fellow needs is a little brain and enough muscle to keep it off the ground! Norwood portable sawmill, Husqvarna chain saws, Ford 8N tractor. Last edited by Post_Oakie; 05-09-2014 at 01:31 PM. I know I shouldn't have gone to this thread, now I'm drooling again with envy. Had the chance to get a Norwood a few years ago but got a tractor instead. Have tried to find a used one but the ones I've found they want about as much for them as a new one. That could be a great barter tool if the SHTF.